The pharynx in the wild type worm (top) is shorter than the pharynx in the mutant worm (bottom). Image credit: modified from figure 1 in Shibata et al. Animals’ complex body plans come at a cost: their development is elaborate and must be delicately controlled. One critical aspect of development is size and shape control—every organ needs to fit in its place. The process requires the orchestration of a dizzying number of pathways, and understanding even a single component is far from trivial. In the May issue of G3, Shibata et al. report how they dissected one such pathway. The researchers simplified the problem by using Caenorhabditis elegans, a nematode worm that has rudimentary versions of some of the developmental pathways in humans and other more complex animals. Worms are often used to study organ development because they are translucent and their cell lineages are clearly defined. In the worms, the researchers found that the secreted protease MIG-17, which is important for gonad development, also localizes to the basement membrane of the pharynx. In mig-17 mutants, the pharynx is abnormally long, suggesting that MIG-17 is required for proper pharyngeal development. The supersized pharynx in mig-17 mutants grows by elongating existing cells rather than adding new cells, the researchers found. This may provide a clue to the normal function of MIG-17. 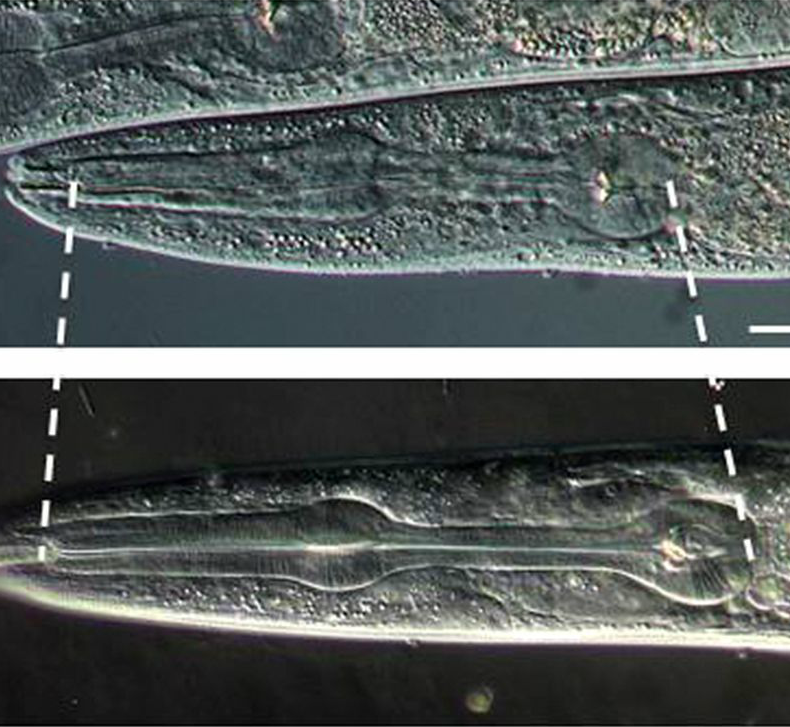 In wild-type worms, the pharynx is thought to be tugged by the surrounding epidermis to stretch it to the proper length, so functional MIG-17 might keep the pharynx small by fostering “slippage” between the epidermis and pharynx. It might do this by reducing adhesiveness between the basement membranes of the pharyngeal end and epidermis. Alternatively, the pharyngeal cells may be long because they actively overgrow, as opposed to being overstretched by the epidermis. If so, the wild type MIG-17 might attenuate pharynx elongation by hardening the pharyngeal basement membrane. Similar pathways might even be involved in human development. MIG-17 belongs to a class of proteins called ADAMTS proteases, which seem to have comparable functions in mammals. Mutations in the human proteins ADAMTS10 and ADAMTS17 cause Weill-Marchesani syndrome, a rare developmental disorder characterized by short stature as well as hand, head and eye abnormalities. MIG-17 seems to bear structural similarity to ADAMTS10 and ADAMTS17, so understanding how it and other proteins in its class work may provide insight into human development—both normal and pathological. Shibata, Y., Kawakado, Y., Hori, N., Tanaka, K., Inoue, R., Takano,T., Kubota, Y., Nishiwaki, K. Organ Length Control by an ADAMTS Extracellular Protease in Caenorhabditis elegans.